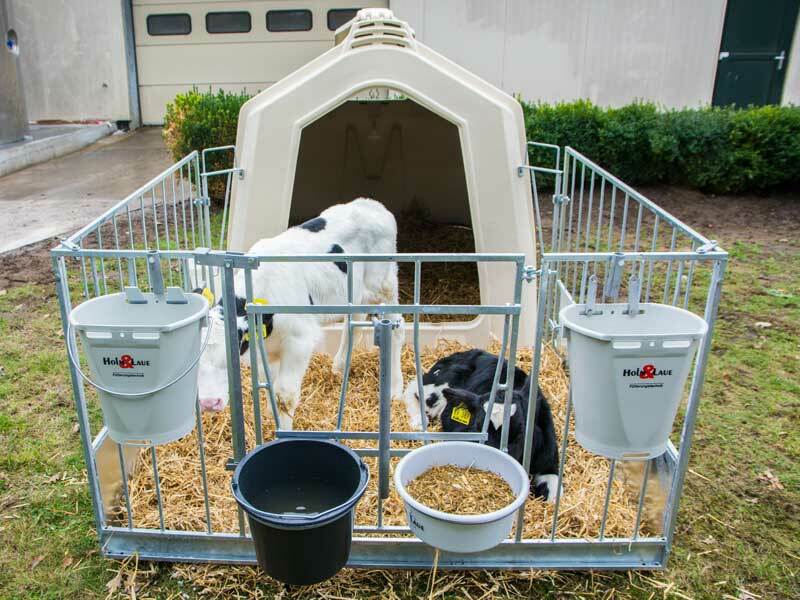 Housing the calves in an outdoor environment has become increasingly popular over recent years as people discover the health benefits. Recent research has shown that calves reared in pairs will adapt to life in a herd more readily than a calf raised alone. Sociability and feed intake improve, and fearfulness decreases. The Twin hutch combined with the Flexyfence allows 5.8 sqm of space which is sufficient for 2 large, or 3 small calves. Cost per head is greatly reduced compared to a single hutch. Recommended for calves up to 12 weeks of age. 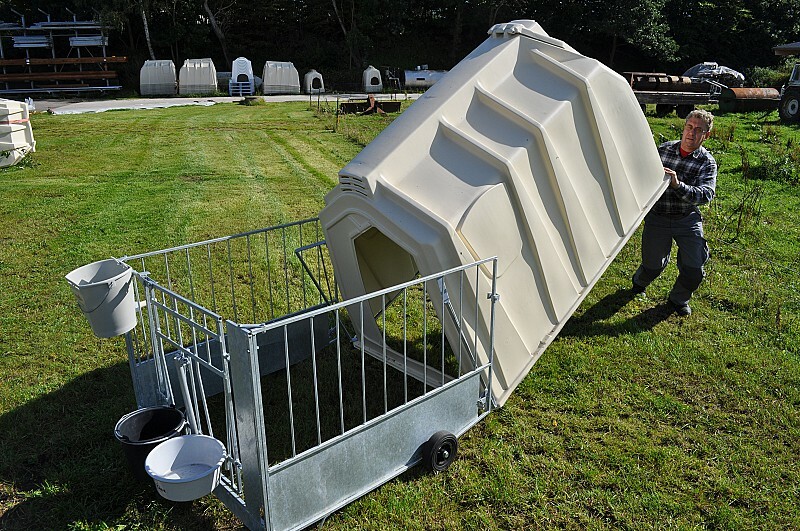 This large single hutch has a multifunctional flap at the rear for improved ventilation and bedding down. The off-set entrance avoids draughts. Recommended for calves less than 8 weeks of age. This fence offers an exercise area and feeding area. There are 2 bucket rings and a place to hang a teated bucket. A wind shield protects the calf and the straw bedding from strong winds. The handy personnel gate allows easy access to the calf, using one hand. The Flexyfence makes the individual Ecohutch more manageable. The teated bucket is located in a corner for training purposes. 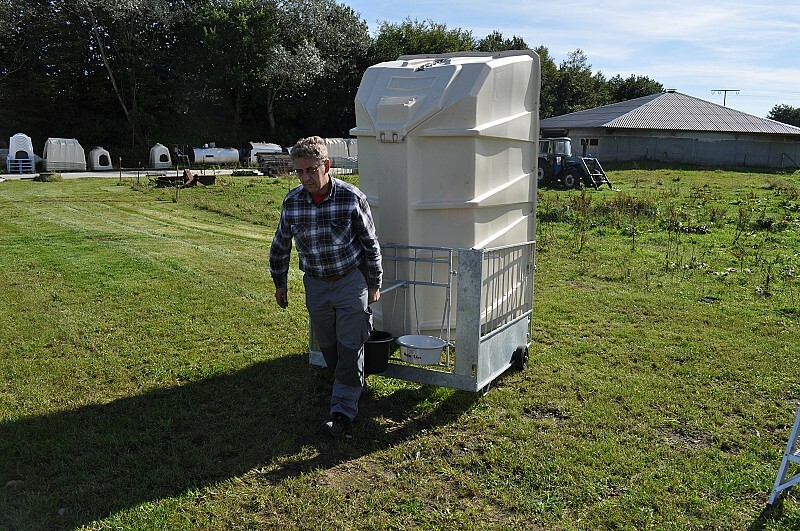 Large lateral wheels help to transport the hutch to the wash-down area. The hutch can be tilted down into the fence, and the fence can be tilted up over the hutch. The Flexyfence can be pushed back all the way over the hutch to lock the calf in the hutch. On some farms it is important to limit contact between baby calves for the first few days or weeks of life. Separation prevents disease transfer. 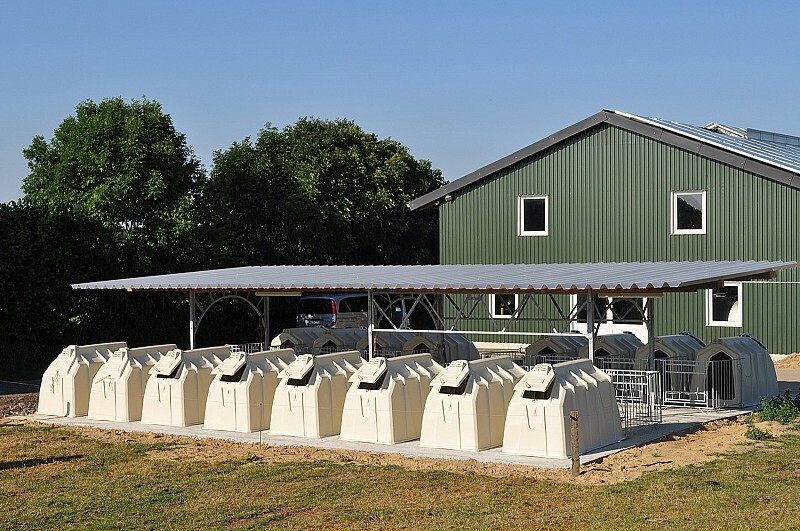 Individual calf hutches fulfil this requirement. In the UK and other damp climates there is always the dilemma of managing the apron outside the hutch door. Is bedding it down a good idea? Bedding holds rainwater and creates a damp bed. However, in summer the calf does need to lie down outside the hutch as it’s too hot inside, and needs a dry bed. 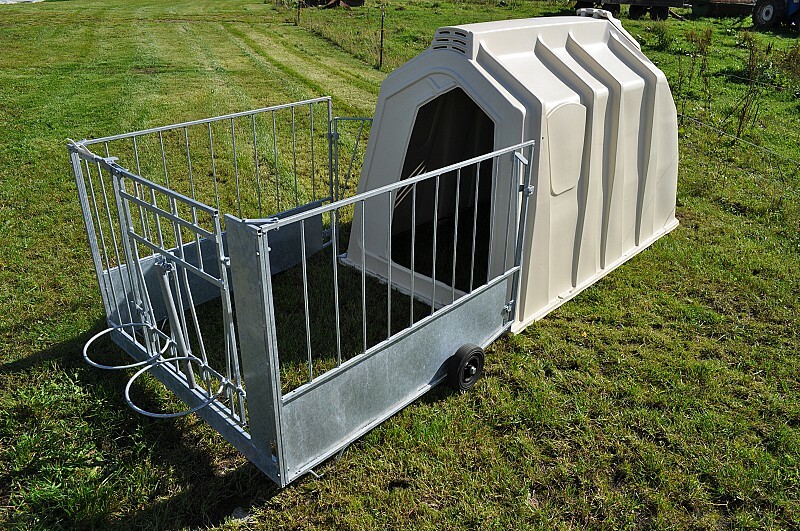 The mobile Calf Garden shelter provides a solution to this problem. The mobile shelter will provide shade from sun and shelter from rain. It also keeps food and straw dry and makes the environment better for the calf rearer. Like the Igloo and veranda system, the calf can choose to lie where it feels comfortable. 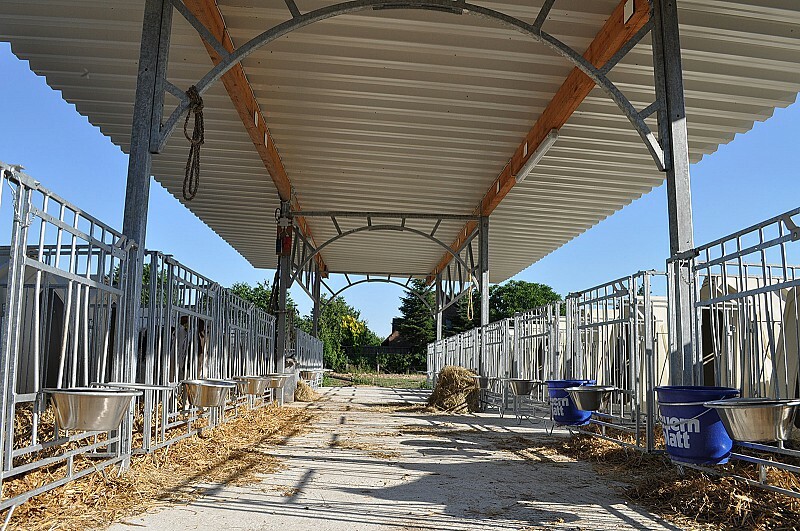 The Calf Garden roof covers 5x2 individual hutches arranged opposite one another. There is a 2.5 metre passageway between.There is a mobile or static version. A Calf Garden ‘extension’ roof is available for the static version only. The roofing sheets are grey, polyester coated. In very exposed locations a ‘storm protection’ kit is an optional extra.